We are very pleased to announce the “Call for Nominations” for the first-of-its-kind Partnership Prize. The Partnership Prize will recognize and reward exemplary partnerships which have been developed in the North Bay region of the San Francisco Bay Area, including Marin, Napa and Sonoma counties. The Partnership Prize is designed to stimulate future partnerships through the networking of nonprofit and for-profit organizations. Cross-sector partnerships are partnerships between two or more partners from the for-profit, nonprofit, education or government sectors which benefit the business or mission objectives of the individual partners while collectively focusing on creating a greater good. To be considered, these partnerships must not be purely philanthropic, such as solely giving or receiving financial support. Exemplary partnerships are those which have created multiple linkages, activities and relationships between the partners, preferably over an extended period of time, and which have demonstrated measurable economic, social or environmental value. *These are not monetary awards. Award plaques will be given and there will be extensive promotion of the winners through NorthBay biz magazine and other media and promotional outlets. Here is the link to the nomination form. http://www.northbaybiz.com/Glow_Your_Biz.php The deadline for nominations is Oct. 29. While the first Partnership Prize is focused on Marin, Napa and Sonoma counties of California, we envision this important program to be greatly expanded in the future. Please enjoy this article I wrote, published in the September issue of IABC’s Communications World magazine. So you found the perfect partner organization for your cause marketing campaign. You self-assessed without mercy. You specified what you’re bringing to the table, researched closely-aligned organizations, compared objectives, and secured a partnership that’s a win-win for everyone. •Exhibiting flexibility and open communication. •Considering scalability and growth potential. These partnership sustainability safeguards are critical, not only to new partnerships but also to those that have been chugging along for a while. All successful relationships, including cause marketing partnerships, are based on trust—and nothing forms trust faster than telling the truth. This means all partners openly discuss their goals, vulnerabilities and needs, and honestly address hidden agendas before they cause problems. This kind of full transparency creates trust with the public—and with all partners. Staying on schedule and on target is important, but when a new opportunity appears, stay open-minded about it, and help others in your partnership to do so as well. It could be a special event, a major media interview, or an entirely “off-the-wall” promotional idea. It could be that a new partner wishes to join your campaign. 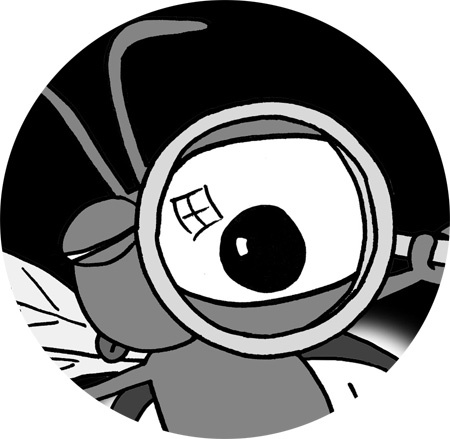 Explore these potential opportunities, while keeping in mind your resources and priorities. Open communication is key as well. If you’re the point-person from your organization, it’s your job to keep all of your stakeholders fully informed of all aspects of the partnership, whether good or not so good. Keep and publish minutes of your meetings, set regular times to convene as a full partnership team, and when issues, disagreements or other challenges arise, communicate your concerns and work them out as a team as soon as possible. In nearly all cases, overcoming challenges together strengthens the partnership and the individual relationships. Flexibility, openness, and clear communication will keep your partnership on solid ground. •Does one partner want a facility built by a certain date? A specific amount of increased funding or donations raised? Certain pro bono services? •Does a partner want a certain number of volunteers recruited? A particular number of volunteer hours provided? •Is a partner expecting a certain value in media exposure, community goodwill or new strategic relationships? To be most effective in evaluating your partnership’s progress, establish starting benchmarks using specific metrics and measurement processes to use throughout the campaign. Here’s an example: For its 2006 Prepare Bay Area partnership with Pacific Gas & Electric (PG&E), the American Red Cross Bay Area chapter used as a starting benchmark its survey finding that only 6% of San Francisco Bay Area residents were prepared for a major disaster. At the beginning of each year of the three-year campaign, the partnership surveyed its target audiences to understand clearly where the initiative stood against its goals. When they hit 26% prepared at the end of the campaign, they had some serious, verifiable bragging rights. 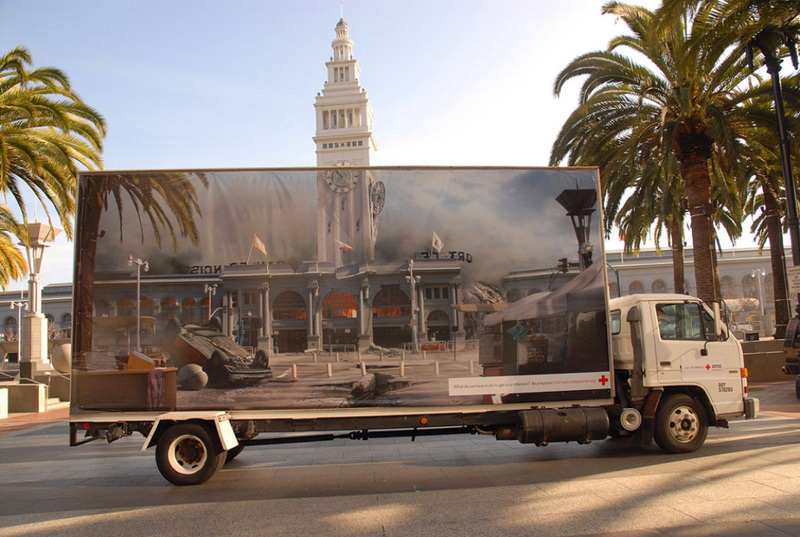 Mobile billboards like this one in front of San Francisco’s Ferry Building showing the potential devastation of an earthquake were part of the Prepare Bay Area campaign, a partnership between the American Red Cross and utility company Pacific Gas & Electric. Measurable benchmarks and ongoing monitoring allow you to know where you are, see whether you are on the right path to success, and tweak your campaign if needed. 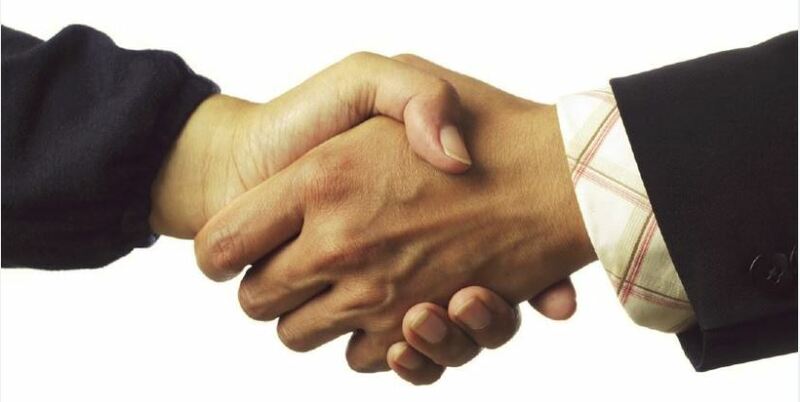 The clearest indication of a successful partnership is when all partners want to continue their relationship. Following the success of Prepare Bay Area, PG&E and the American Red Cross Bay Area chapter again teamed up to expand the preparedness program through a broader Ready Neighborhoods initiative. In order to deepen their impact by scaling the program out beyond the Bay Area and across the state of California, PG&E more than doubled its original US$1 million over three-years financial commitment–and has continued to partner in this important campaign ever since. The recognition PG&E and the American Red Cross chapters have received due to their Ready Neighborhoods partnership has been tremendous: Last year, the U.S. Federal Emergency Management Agency presented these organizations with its prestigious Community Preparedness Award in a high-profile ceremony and community event. The most successful partnerships do not hit their stride until the second or third year. But if you’ve built trust and confidence, remained flexible and communicative, measured your pre-set criteria and kept your eye on future growth, you’ll have a strong support system of energized team members and partners who want to keep it going, establishing a continual cycle of creating a greater good. 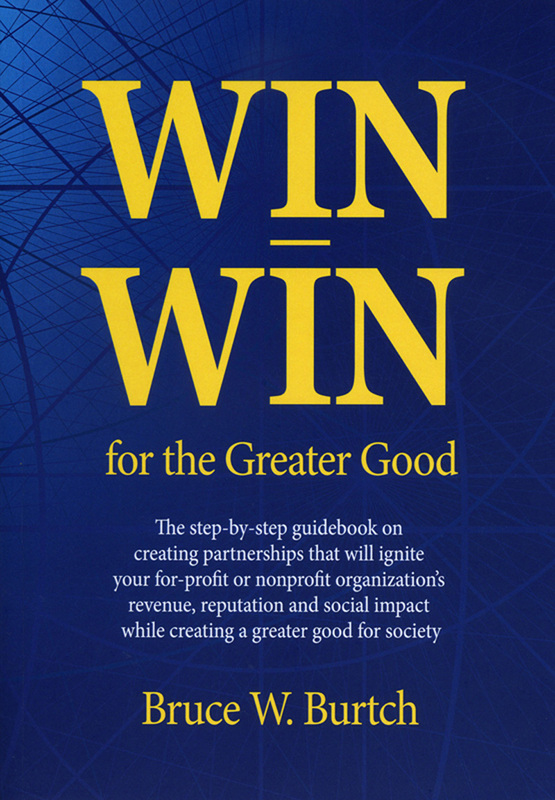 I am thrilled with the exceptional testimonials and reviews for Win-Win for the Greater Good, the most comprehensive “how-to” guidebook on the development of cross-sector partnerships – partnerships between the nonprofit, for-profit, education and government sectors. Called a “must-read for any organization” by Howard Behar, President (retired) Starbucks Coffee, Win-Win provides a proven-effective 12-step process based on over 35 years of partnership development on the local, regional and national levels. To receive a 20% discount ($4) off the $19.95 retail price of the book, visit http://www.createspace.com/4384579 and in the checkout process put the following code in the box: JHHVKMHW. “Win-Win, lucidly captures Bruce Burtch’s decades of practitioner wisdom on cross-sector partnerships. The book is filled with rich examples and insightful practical guidance on how to build powerful partnerships. Read it and learn from a master!” James E. Austin, Professor Emeritus, Harvard Business School. Do you really know what you want to do in a partnership? 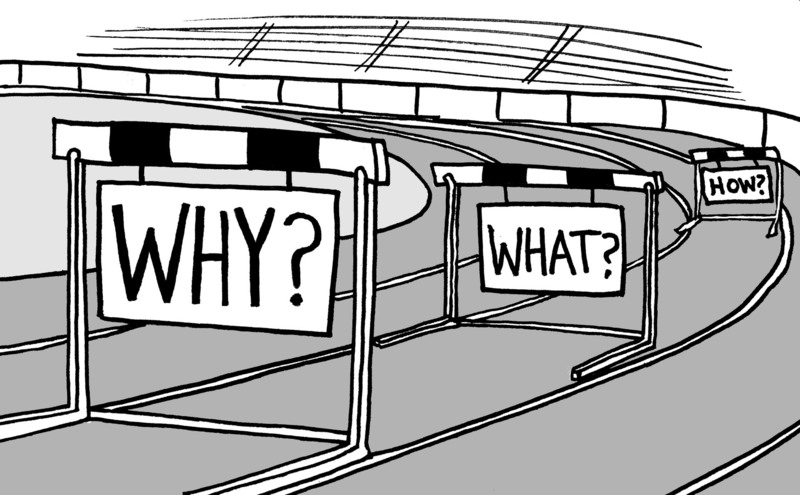 Before beginning the deep dive into what your organization would like to do through a cross-sector partnership and then defining your key objectives, there is a critical first step – asking the question:Do you know your WHY? The products or services your organization provides is the what you do. The manner in which you deliver these products or services to your customers or the public is how you do that delivery. However, the most important question that you and your organization must determine is why you do what you do. The why must come first. The why is your driving motivation. It’s what inspires you, your employees, your donors, indeed all your stakeholders, to take interest in your organization and to support it wholeheartedly. Without a strong and articulated why, you are just another nuts-and-bolts organization (in any sector), and one of the very many. The similarities to what we have described as a glowing business are obviously related to the why. Glow starts from within, and radiates outwardly, and so does the why. You can’t have a glowing organization unless all your stakeholders are inspired and motivated, thrilled to be involved and thrilled to tell others about this involvement. My belief is that the best and maybe the only way to create this glow, this why, is by embedding a cause consciousness into the very essence and culture of your organization. When your organization stands not just for your own benefit, but far more importantly, for what you can do for others and to create a greater good…that’s the glow, that’s the why. With the understanding of your why firmly in place, now you can move on to what you want to do. We have explored the multiple benefits that can come from a cross-sector partnership. But practically speaking, your organization must choose the specific objective or a very short list of priorities that are the highest priorities. For example, you may decide that your top priority is to raise the sales revenue of a particular product or service, provide employee volunteer opportunities in your community or to open up a new store or business location. If you are a nonprofit, your primary objectives may be to increase your donor base, fund and open a new project or program, attract corporate volunteers, develop an earned income opportunity, etc. To assist in determining your “What do you want to do?” process, you may wish to utilize the two “Top 10” lists: Benefits a for-profit organization can receive by working with a nonprofit organization and Benefits a nonprofit organization can receive by working with a for-profit organization, provided earlier in this book, or preferably, review the complete lists of benefits which can be found in the Resource Center at http://www.bruceburtch.com. Now you have over 30 distinct benefits your organization may be able to receive in a cross-sector partnership and these will serve as a guide in determining which objectives would have the greatest positive impact on the needs, challenges or opportunities facing your organization. When developing your strongest case for what will work best for your organization, and in due course what will provide the best partnership opportunity, you need to select from these ideas or objectives your top three, and then very clearly, define and agree upon your number one objective. By defining your top objectives, and especially by selecting one as your top objective, you significantly increase your potential for a successful project or campaign. If you try to address too many objectives you will weaken the energy, resources and talent, and potentially not accomplish any of your objectives. Please visit http://www.bruceburtch.com for more information about cross-sector partnerships and Win-Win for the Greater Good. Yogi Berra had it right: It’s like déjà vu all over again. Today I stood center-stage at the Great American Theater, the largest live performance auditorium at California’s Great America in Santa Clara. The occasion was the annual convention of ACE, the American Coaster Enthusiasts, those wild and daring people who travel the country experiencing every form of twist and turn, soaring heights to plunging depths, of the country’s most challenging roller coasters. Timid is not a word heard in these surroundings. I had been invited as their special guest, because on March 20, 1976 as Public Affairs Manager of what was then called Marriott’s Great America, I had the wonderful and rather daunting (at age 25) responsibility of designing the opening promotion of Great America, the largest project at that time in the history of Marriott Corporation. Facing the crowd of 350 coaster enthusiasts, I drifted easily back to those earliest years of my career, and especially to a particular time when I stood at that exact spot. 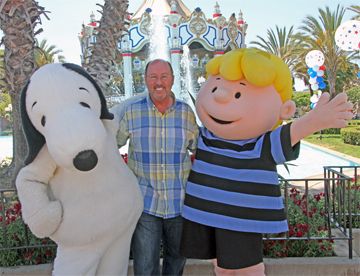 It was 1976 and I had invited Clint Eastwood and Merv Griffin to visit Great America. I wanted them to experience the simply outstanding live entertainment performances that at the time were seen as the standout feature of the theme park. The show that was playing that first year was Music America, a high energy musical romp through 45 Americana songs. Performed by an extremely talented cast of 25 high school and college-aged men and women, supported by a 17-piece orchestra made up of similar ages, this extravaganza climaxed with an audience standing ovation at all performances. At the close of that particular show as the audience filed towards the exit doors, I escorted Clint and Merv onto the stage. We lifted a portion of the huge red velvet curtain and we proceeded under to greet the performers. Emerging on the other side these two internationally-known stars brought the stretching and exhausted cast to a startled halt. After exchanging pleasantries and a quite a few OMG remarks, Merv Griffin offered them the ultimate compliment. He said, “There is nothing on Broadway that is anywhere near as entertaining as what we just witnessed.” These words made everyone’s day, probably year. As I emerged from the theater this afternoon, I walked slowly, dreamily, through a very changed Great America. Gone were the strolling marching bands, steam driven train with its haunting whistle, gone were Bugs Bunny and the other Warner Brothers characters, replaced by Snoopy, Charlie Brown and friends. What once was a broad offering of live entertainment constantly erupting from all directions has now morphed into a primarily ride-focused amusement park. Still very nice, but for me, not as nice. As I left in the late afternoon I noticed a sandwich board near the front entrance. It said that on a day coming up California’s Great America would be donating a portion of that day’s proceeds to the Avon Walk for Breast Cancer. I flashed-back to 1976 when I had developed a partnership between Marriott’s Great America and the March of Dimes to help promote the opening of our new theme park, while raising much-needed funds to fight children’s birth defects. That partnership raised $2.5 million (a lot of money in 1976), a whopping 40% more than had ever been raised in the Western Region of the March of Dimes. That partnership is considered the first cause marketing program in history, and as the designer, I have been called the “father of cause marketing” by the Cause Marketing Forum. For me, today was full of intense emotion, revisited experiences, and once again, enjoying the exploding laughter of a family getting soaked together on the water ride. As I drove away, I remembered the line I wrote for our highway billboard on the opening day 38 years ago: Super Smiles and Summer Fun, Welcome World, We’ve Just Begun. Déjà vu, all over again, again. Wikipedia defines a stakeholder as: “Any person, group, organization, or system who affects or can be affected by an organization’s actions.” Look around at all the people who are involved in your organization, both internally and externally: your employees, your customers, your shareholders, your vendors, your community, your business partners, government regulators, the media – these are your stakeholders and these are the people who really matter. These are the people you must protect, serve and value the most. When you focus your efforts on bringing value to all your stakeholders, you create the greatest beneficial impact for your organization. The converse is also true – if your stakeholders are not engaged, not valued, they have the potential to have a negative, and sometimes significant, impact on your organization. 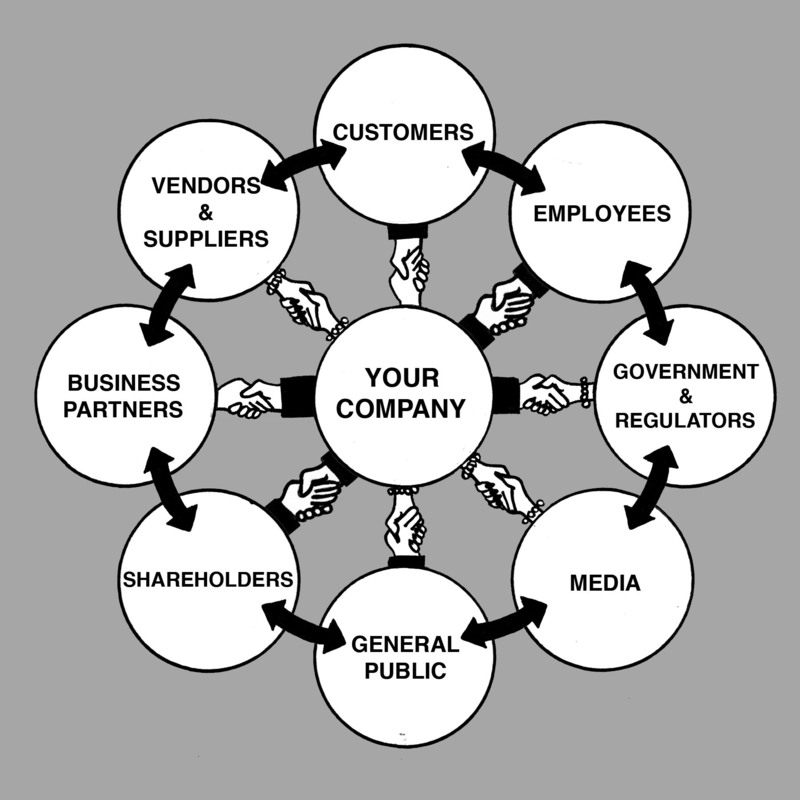 Here is a diagram that illustrates the many stakeholders of a typical for-profit organization. The stakeholders for a nonprofit organization are very similar. Your shareholders are your donors, your customers are the people you serve, your business partners are your volunteers, etc. As you see, there is an interrelationship, indeed interdependency, where all stakeholders are involved in a give-and-take relationship with the organization of which they are stakeholders. At first glance, it would seem that the relationships are primarily between the organization and the outer circle of their stakeholders. However, as this diagram reflects, the stakeholders themselves can have separate relationships between themselves, and thus impact and influence the entire organizational ecosystem. When an employee believes that their organization has a particularly strong commitment to being a good citizen in their community, they will loudly and confidently communicate this belief. Consequently, the stakeholder and communication/effect cycle is potentially more interrelated. The ramifications can be significant, as any positive or negative influence a stakeholder has on other stakeholders can have a corresponding positive or negative influence on the organization itself. The very good news is that when an organization is focused on the success of all stakeholders, all stakeholders are focused on the success of the organization. And when an organization is focused on not only benefiting all stakeholders, but additionally in serving the greater good through a well-designed and well-executed cross-sector partnership, your organization will begin to glow. Your stakeholders will provide an honest critique because they have a vested interest in the success of your organization. They will provide creative input, business contacts, perhaps funding, and a myriad of other assets that will serve your cross-sector partnership endeavors and your organization well. Are you prepared for partnership success? Here’s how to find out. Before you start your partner exploration process, you need to analyze carefully your reasons for wanting a partnership, assess your abilities and assets, and especially your commitment to deliver your end of the bargain. A clear understanding and preparedness when entering into a cross-sector partnership comes only after a comprehensive internal assessment confirming that you’re ready, willing and able to be a productive partner. In other words: you must first know yourself before you can reach out to others. Who are you? Most organizations think they have a pretty good idea of who they are. They may have vision statements, mission statements, standard operating procedures, annual reports and/or press releases that tout their latest products, services, partners, achievements, etc. However, without analyzing your corporate culture, and especially how you’re seen by the public, you may not know who you really are. Amazon founder Jeff Bezos described your organization’s brand as “What people say about you when you’re not in the room.” Your brand, which is a fancy way of saying your reputation, is not who or what you think you are but how you are viewed by all who come in contact with your organization. Taking the time to develop a clear understanding of what your organization really stands for and how it is viewed by the public is not only the necessary foundation for a successful cross-sector partnership, but for the success of your business in general. Before you begin the Assessment Process, I strongly recommended that this process be led by your senior management, preferably your CEO or Executive Director. S/he must be involved in this cross-sector partnership conversation and Assessment Process, at least in the beginning stages, as this individual sets the overall tone, direction and strategy of your organization. I suggest that your Assessment Process team include several people from the list below, though a smaller organization may not have or need this deep a team. The entire Assessment Process should take no more than two or three meetings, especially if notes are provided and next steps are determined as assignments for each member of the team to prepare for the next meeting. The length of this process depends greatly on the commitment of the team, leadership involvement, and how much work may have already been done by your organization. In the course of this Assessment Process, problematic issues may arise – be sure to address them immediately. Such issues rarely go away and can be very embarrassing and a waste of time and money if not handled early and well. The key to this critical exercise is to ascertain if your company has the motivation, ability, personnel, budget and leadership to undertake a long-term partnership, with all of its inherent bumps and challenges…and rewards. Step 1: What Do You Want to Do? Step 3: Is Your Organization Ready for a Cross-Sector Partnership or Cause Marketing Campaign? Step 4: What Do You Bring to a Partnership? Note: An electronic copy of the complete Assessment Process can be found at the Resource Center at http://www.bruceburtch.com. You are currently browsing the archives for the nonprofit/for-profit partnerships category. Bruce Burtch: I created this blog to provide a discussion forum on the multiple opportunities and challenges of cause marketing and cross-sector partnerships. I believe there is nothing else in business today that comes even close to providing as many benefits to as many stakeholders as a well-conceived and well-executed cross-sector partnership. Most importantly, by embedding a "cause consciousness" into your organization, you will benefit society as a whole. And when you focus on that greater good, you begin to glow.